"[T]hese books are dang cute. So freaking cute. You just get happy by reading." 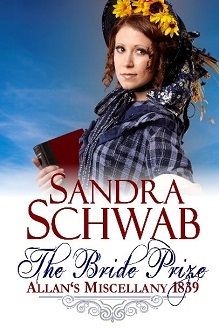 Or get The Bride Prize with the rest of Sandra's Starter Library! I have chosen a slightly antiquated spelling of Milton-Malzor. In 19th-century documents the place is sometimes also referred to as Middleton-Malzor (with or without hyphen) as well as Milton Malsor (this is the name the village is still called today). The Eglinton Tournament was the most elaborate (and costly!) staging of the gothic revival. In August 1839 ten thousands of people flocked to Ayrshire to watch Lord Eglinton and his noble friends don medieval armor (commissioned from Messrs. Pratt in Bond Street, London) and joust like knights of old. & an unfortunate dearth of umbrellas. It's 1839, and Lord Eglinton's tournament in Scotland is the most anticipated event of the year: he and some of his noble friends will don medieval armor and joust like knights of old. Does this mean a revival of true chivalry? Miss Florence Marsh thinks it might. Or is the tournament mere tomfoolery and the greatest folly of the century? Mr. Robert Beaton thinks it is. But when Flo and Robbie meet at Eglinton Park, they'll soon learn that a dash of romance can make the greatest differences look rather small and that true love might find you in the most unlikely place. If only Robbie wasn't working for that scandalous new magazine Allan's Miscellany! If only Flo's father didn't detest the periodical press! And if only they had remembered to bring an umbrella! "Sandra Schwab strikes again with her new series!!" "The mix of humor with historical details and unlikely romance in The Bride Prize: Allan's Miscellany 1839 is adorable. [...] I laughed from start to finish and loved the romance that held the story together." "The Bride Prize is, in a word, delightful. [...] The Bride Prize is well worth your time. I smiled for a long time when it was over. I cannot wait until the next installment in this series." The morning sun shone into the snug drawing room, and a soft breeze carried the scent of roses through the open windows. Miss Florence Marsh sat on the sofa, mending one of her father’s shirts, while at the table, her aunt studied a periodical she had received from one of the neighbors. The older woman stabbed a finger at a page of the periodical. “That’s what it says here.” She lifted her lorgnette and read out aloud: “‘Much difficulty exists in procuring the requisite number of knights and esquires for the approaching tournament at Eglinton Castle. Those already enlisted meet at St. John’s Wood barracks every Tuesday for practice.’” She lowered the lorgnette and looked at Flo. “Ha! I knew it!” she said triumphantly. Her sewing lying forgotten in her lap, Flo stared at her aunt. “You knew there was going to be a tournament at Eglinton Castle?” A tournament? In 1839? Surely, by now her brows were touching her hairline. Who had ever heard of such a thing? “7 July,” Flo said, still perplexed. Why in all the world was her aunt so excited about this tournament? “It is too bad—why does Mrs. Wemmingford always take so long before she passes on the magazine? I almost think she might be giving it to Miss Freye before she gives it to me! Oh dear, oh dear.” She sighed. “I will have to ask Mrs. Lowood whether her sister has already sent her last month’s Court and Lady’s Magazine, and you know how Mrs. Lowood is.” She sighed. Flo blinked. “Too late for what?” she asked. “Oh dear! We wouldn’t want to let Papa see it then.” Flo’s father was very particular about the periodical press: on several occasions he had expressed a strong dislike of “newfangled” modern magazines, which he considered most inappropriate for the household of Mr. Gerald Marsh, Esq.—after all, the former private secretary of the late Lord Arley had a position to uphold in society (be that society ever so small). Smiling, Flo put an affectionate arm around the older woman’s shoulders. “Of course not, Aunt Lizzie.” Her aunt doted on her elder brother, who had taken her in when her husband had died and left her almost penniless. “Well, I wouldn’t want to believe you anything else, but…” She glanced at Flo from the corner of her eye. “He can be a bit difficult at times, can’t he? He probably read about the tournament and thought it much too awkward to travel all the way to— Do you know where Eglinton Castle is, my dear?—No, neither do I. But you see, if you were to go with him, it would be quite alright.” Aunt Lizzie nodded, apparently warming up to her idea. And thus the two women sat down and got to work. Flo left The Court and Lady’s Magazine to her aunt, while she herself tackled the other magazine. Though Mrs. Lowood had exaggerated and not all articles were satirical, Allan’s Miscellany still proved to be exactly the kind of publication Flo’s father detested most passionately as proof of the irreverence of the present generation. At least it contained some charming illustrations, done by one “RB”. It even was forthcoming about the tournament—if rather prejudiced against the event, which the writer called “Lord Eglinton’s medieval tomfoolery”. We understand that the young noodles engaged in this silly affair will be weighed down by the whole impediments of chivalry, rather than being strapped into boilerplates and saucepans as would befit their nonsensical undertaking. Questions as to the legal situation should any of the flowers of our aristocracy be bludgeoned to death during their medieval venture appear to us to be rather beside the point, considering the utter uselessness of all the parties involved and the absence of any loss to society should any of them succumb to death by chivalry. Goodness! Could this article be more cold-blooded? Wrinkling her nose, Flo quickly scanned the rest of the text. For all that we care, they have our blessing to scamper off to Ayrshire at the end of August and indulge in their penchant for getting their own heads broken. For those interested in the spectacle, we are informed that tickets can be procured by writing to the estate office at Eglinton. Charging down the lists towards the wooden dummy on wheels, the noble Knight of the Swan suddenly lost both his balance and the control over his horse. One moment he was a shining star of chivalry, his armor glinting in the sun, and the next he was flying over the head of his horse and landed in the mud in an undignified sprawl. A groan rippled through the crowd of spectators, then laughter as the Knight of the Swan—the Honorable Mr. Jerningham—heaved himself upright, unhurt, with nary a dent in his fine armor. Damn, we need somebody to do satirical illustrations, he thought, glancing up to see how the next knight riding against the wooden dummy would fare. Once again, he was struck by the incongruity of the scene: The gardens of the Eyre Arms had been transformed into a jousting ground, with elevated benches on either side to accommodate the spectators, members of the gentry and the aristocracy. There were several thousand people present this afternoon to watch the chivalric proceedings—and this was merely the final rehearsal before the tournament proper! There was no question: he needed to get Mac up to Ayrshire next month. All the papers and periodicals would be writing about Lord Eglinton’s medieval spectacle. Unthinkable that Allan’s Miscellany should not! Down at the grounds, the dummy knight was cleared away and preparations were made for the main event of this rehearsal: the tilting between the Lords Eglinton and Waterford. Lud! It’s Ivanhoe sprung up to life! Or rather, Astley’s in St. John’s Wood. A circus show with buffoons in sparkling armor, who took their chivalric endeavor very, very seriously indeed. They had even given themselves names—the Knight of the Swan, the Knight of the Dragon; there were a few lions as well—as if they were children playing at dressing up. Oh, Mac would just love this—he would get that glittering look in his eyes as if he wished nothing more than to level somebody. Or at very least demolish them with words. He was very good at that, Mac was. It had been his sarcastic wit which had made Allan’s Miscellany notorious these past months. Good for making people talk about the magazine, but not necessarily something which would secure them a wider audience. Hence it fell to Robbie to tune down his friend’s more caustic outbursts. A flourish of trumpets sounded, and amidst the cheering of the crowd, the two noble lords…eh, knights charged at each other. Or rather, trotted towards each other and passed each other with a good few yards in between them. If anybody had expected the thunder of galloping hooves from a historical novel, they would be sorely disappointed. Robbie chuckled. They should have taken some lessons from the performers at Astley’s! After three equally tame passes, a murmur rippled through the audience, and quite suddenly most of the noble spectators were on their feet, having apparently decided en masse that it was time they went home. Everybody pushed towards the narrow passage that led outside, and in no time at all, the assembled nobility and gentry had become hopelessly stuck. His face splitting into a wide grin, Robbie did a quick sketch of their wasted efforts. Given that outside, the streets and roads around the Eyre Arms were all crammed with waiting carriages, he supposed it would take considerable time before the crowd would become unstuck again. His stomach rumbled, reminding him that it had been a very long time since he had had that hasty lunch of a rather leathery mutton pie from the public house. Getting up, he snapped his notebook shut and strolled in the opposite direction from the large building of the Eyre Arms. At the back of the garden, he found a spot where he could climb over the fence without ripping his clothes or impaling himself. He walked on, towards Regent’s Park and took the bus from Gloucester Gate down to the Strand. He chose a seat on top of the carriage, where he could enjoy the sunshine and the lively din of the teaming metropolis. There was nothing quite like it, that big, sprawling city, throbbing with life and misery, splendor and dirt! Down at the Strand, Robbie climbed off the bus, whistling a bawdy song he had heard at the Cider Cellar the night before. He found her kind and willing. Idly, he wondered whether he should fortify himself with rolls and sausages before returning to “the Den”, the backroom above Uncle Allan’s printing shop, where Mac would hole himself up and write like a madman twelve hours a day. They needed, Robbie decided, not just an artist for comic illustrations, but also another writer, or Mac would work himself to death within the next six months. Frowning, he passed through Temple Bar and walked down loud and busy Fleet Street. He and Mac had come down from Edinburgh five months ago in pursuit of their dream to work for a magazine that would be read throughout the Empire—easier said than done, as they had found to their chagrin. After several weeks of doing cheap commissions—a few articles for weeklies, some illustrations for envelopes—envelopes!—they had by chance met their old friend Jonathan Allan, whose uncle not only owned a print shop, but also had a soft heart for young men and their dreams. He had also quite fancied the idea of having a magazine named after himself, and thus, with some financial help from Uncle Allan Allan’s Miscellany had been born. The tinkling of a bell announced a muffin man coming towards Robbie, a large, now mostly empty tray on his head. He sold Robbie his last four muffins—cold, alas. Even without butter, a toasted muffin would still be better than another mutton pie. He turned into Bouverie Street, then into the narrower Pleydell Street, where the sign ‘Allan & Son, Printers’ greeted him in bold letters. Upon Robbie’s knock, Jon opened the door in his shirt-sleeves, his normally immaculate dark locks tousled, his maroon-colored waist-coat crumpled—a sure sign that Jon had been involved in what he called ‘the necessary evil’: checking the books. “Mac’s still up?” Robbie asked. “Right-ho. Let’s see whether we’ll come out of this alive,” Robbie said cheerfully and climbed the stairs. When they pushed the door at the end of the gallery open, they found the large table that dominated the room littered with stacks of paper, a few newspapers and a magazine or two. In the middle of the chaos sat William MacNeil, brilliant editor of Allan’s Miscellany. As ‘Mr. Urbanus’ he had already taught novelists, poets, and playwrights to fear his caustic, sharp pen. At the moment, Mac was writing—of course. At their entrance, he looked up, his blue eyes drilling into Robbie. He raised a copper-red eyebrow. “You’ve been to that travesty up in St. John’s Wood,” he stated, crossing his arms in front of his chest. “I suppose they would. But you can always shout ‘boo’,” Robbie said in a kind voice, then grinned. “It’s going to be very amusing, that tournament,” Robbie offered.